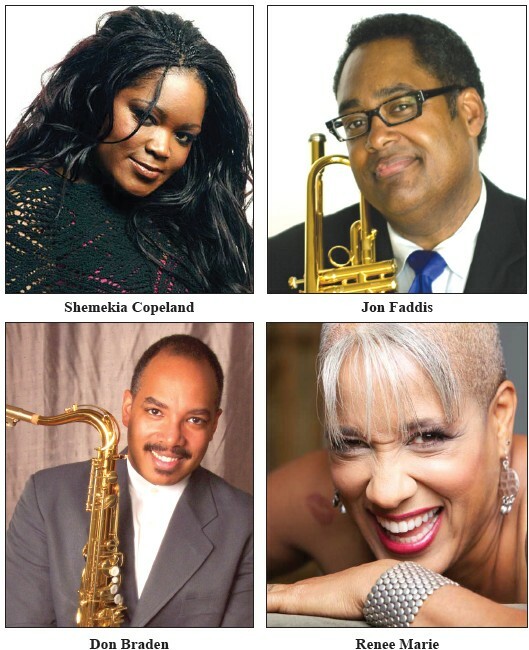 The 33rd Annual Savannah Jazz Festival will be held September 21st – 27th 2014. The Savannah Jazz Music Festival brings live music to thousands of Savannah residents and tourists at no cost. This year enjoy music by the finest local, regional, national and international jazz artists. The Festival begins in Habersham Village on Sunday and Monday, September 21 & 22 at 2 PM. On Wednesday the festival moves downtown to B & D Burgers in City Market. On Thursday through Saturday at Forsyth Park it’s “Blues on the Green” beginning at 6 PM with SSU Choir; 7:00 PM with Eric Culberson Trio; 8:15 PM Steady Rollin’ Bob Margolin; 9:30 PM Shemikia Copeland Band; 11:00 PM. Jam Session at Rancho Alegre. On Friday, September 26 beginning at 6:00 PM Velvet Caravan; 7:00 PM Dee Lucas; 8:15 PM UNF Jazz Ensemble; 9:30 PM Rene Marie Quartet.11:00 PM. Jam Session at Rancho Alegre. On Saturday, September 27 beginning at 5:00PM Doc Handy; 6:00 PM The Jazz Hall of Fame Induction and Concert, featuring Teddy Adams, Huxsie Scott, Eddie Pazant, Howard Paul, Ben Riley, Delbert Felix (new inductee), Eric Vaughn (new inductee), and Dr. Randy Reese (new inductee). Beginning at 7:00 PM Audrey Shakir Quartet; 8:15 PM Don Braden Quartet; and 9:30 PM Jon Faddis with Savannah Jazz Orchestra.11:00 PM Jam Session at Rancho Alegre. For more information visit savannahjazzfestival.org/savjazzfest.